An decent top-down racer, if only it had more variety to bring to the table. Mantis Burn Racing is a top down racer from VooFoo Studios, a developer normally known for their "parlour games" (as Creative Director Shaun Read described it) like Backgammon Blitz, Pure Chess and Hustle Kings. Breaking from this mould, MBR has the studio taking aim at another genre and applying its trademark visual quality, and it does this very well. The visuals are impressive, but not over the top, and VooFoo have done a lot to make sure the simplicity of the top-down racer remains. The car design is simple, but with a bit more of a wow factor to them, and away from the tracks there are decorative features like chasms and buildings and this all makes the game look more modern. Essentially, though, the design, layout and format are all the same as beloved classics like Micro Machines. Apart from the odd destructible on the track, they are windy, bendy pathways with plenty of u-turns and hairpins, sections that are characteristic of the genre. Tracks are challenging and require great handling and precision turning a lot of the time, and memorising the layout is often a key to success. What Mantis Burns Racing excels at is offering moreish gameplay, and by that we mean that the buzz of overtaking an opponent on a jump or nailing a wide drift round a turn is so great that it makes us want just one more race (which of course turns into more). The racing is rather addictive and the satisfaction from success only intensifies this, especially since it offers cool jumps, skidding tires and high-speed boosts to relish again and again. With the option to customise the camera as well, there is all the more reason to enjoy what Mantis Burn Racing offers. The career mode also fuelled our addiction, offering seven different seasons, with each being split into a tree of events you have to work along to accumulate gears to unlock the next season. The desire to keep pushing on and get further along the path is part of how it gets you hooked, especially since optional branches of this tree can unlock upgrades as well, some of which are randomised. In terms of events on offer, there's Race, Hot Lap, Sprint, Knockout, Time Trial, Accumulator, Overtake and League. In other words, there's no shortage, and this variety keeps the career from getting stale, as a Race can be followed by an Overtake event which offers a totally new challenge. With so many events split into these seasons, there is also enough substance there to challenge players for hours, especially if they want to complete all events 100%. This is made even more challenging by the fact that each event offers three objectives, awarding one, two and three gears each. These challenges can be as simple as winning the event, but also involve things like a making a certain amount of drifts or taking a shortcut. Sometimes, then, simply winning isn't enough to progress or complete an event fully, and players need to consider more than one thing if they're to get all the gears available. The upgrades are a great feature, and simple to use as well. There are several types of upgrades, such as suspension, gearbox and boost, and assigning these are as simple as placing their circular symbols into a slot, and if all the slots are full you can use credits to pay to level up your vehicle, giving more slots. Balance has to be considered too, as levelling up your boost without tires will ensure you are fast but won't help you turn. With the option to change the colour of your vehicle and your boost as well, there's plenty of reason to keep popping back to the garage to keep tweaking your cars. 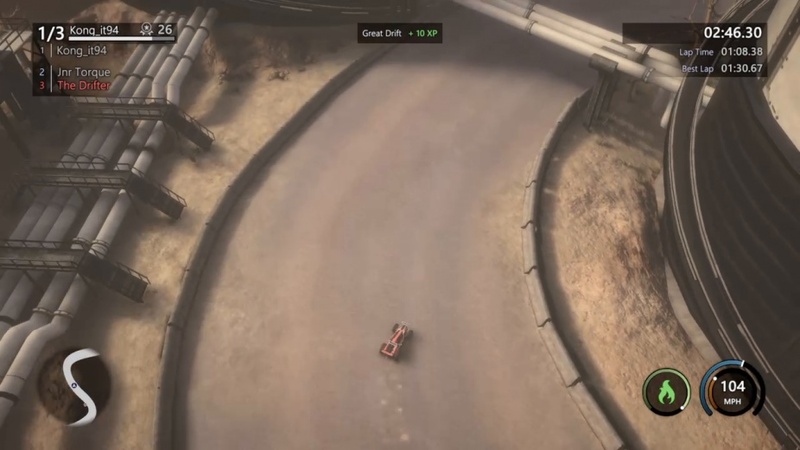 There aren't tons of vehicles in the game, but with a top-down racer trying to maintain the beautiful simplicity of the genre this is fine as there is one light, medium and heavy vehicle per skill bracket i.e. Rookie, Pro and Veteran, resulting in nine in total. These freshen up the options every now and then, while also making sure the choice isn't overwhelming, something that works very well. One element that is confusing, however, is what statistic each upgrade changes. After you assign enough of them it shows you on the stats what the difference is, but with each a label of "Increases acceleration" or something similar would have made the whole process a lot clearer, as sometimes it doesn't show you at all what difference it will make to your vehicle, and with upgrades as important as they are you can't afford to be wasting them. Another element that fell flat with Mantis Burn Racing was the environments. There just aren't enough of them, and although the two on offer (Sand Town and New Shangri-La) look wonderful and offer differences, with fantastic decoration in and around the track, they got old pretty quickly and it was a shame we didn't see more, like possibly an icy one, or one in a jungle for instance. The same applies to the tracks themselves, as there are eight in the game, and although they are reversed occasionally, they become familiar very quickly, especially if you play through the career. Audio-wise, the game's music is for the most part very good. There's an electro feel throughout, with different songs suiting each track. Although the loops when the tracks end are quite noticeable, this isn't too much of an issue and we were surprised that, given the repetition of tracks in the game, we weren't more annoyed at the same songs coming up, because they're subtle enough to avoid grating on you. 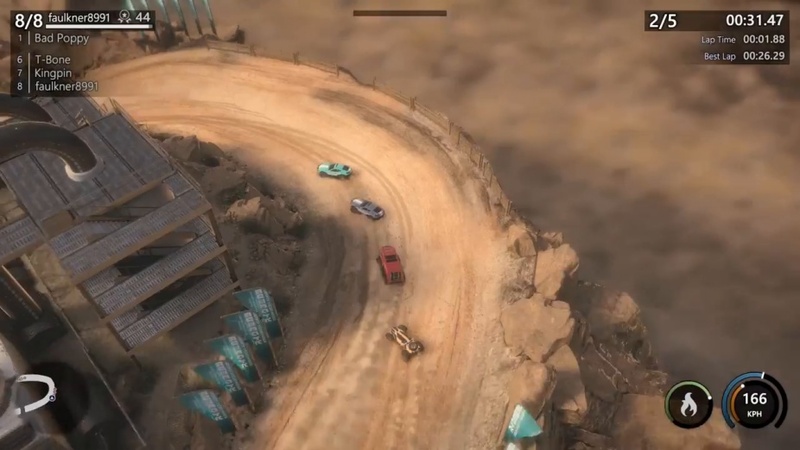 With a game like this multiplayer is key and of course Mantis Burn Racing offers both local and online multiplayer, and all event types are available to play. The experience can be customised, too, so you can use upgraded vehicles or normal ones depending on your preference, and you can even use vehicles you haven't unlocked in the career. Although we only got one race online, as we couldn't find many races to join, we played a lot of the local multiplayer (you can have between two and four players), and while that was fun for a while and offered some tense races, especially if the player you're racing against is similar in ability, we did notice the same maps repeat themselves. Once you've played a couple of hours and played each track about three times, repetitiveness starts to creep in and the enjoyment wears off, unfortunately. For the most part, though, Mantis Burn Racing is a very entertaining top-down racer that plays very well, and its biggest fault is that it doesn't have the longevity to keep players coming back. The tracks repeat themselves too often, as do the environments, and after the career we can't see ourselves spending nearly the same amount of time with it. Aside from that, the only issues we had were minor, such as buildings in New Shangri-La getting in the way of the camera occasionally, but the racing experience itself is great fun and provided some intense and extremely enjoyable races. Very entertaining top-down racing, Visually impressive, Accessible upgrade system, Great electro soundtrack. Some camera issues, Limited amount of tracks and environments, Not enough longevity, Upgrades sometimes unclear.